On 05th Feb. 2018 team of Siltara became the champions of the 07th MILAAP – Dr. S.K.Mishra Memorial Rural Cricket Tournament organized by GPIL at Tanda ground. The Siltara team defeated Silyari team in the final of the tournament received cash prize of Rs. 51,000. Runner-up Silyari team was also felicitated with a cash prize of Rs.25,000. Man of the Series award with a cash prize of Rs.11,000.00 declared to Suraj player of Silyari who scores 123 runs thought-out the tournament. Similarly, for all-round performance Hemant Sahu player from Murra village was felicitated with Best Player of the Tournament award for hitting 90 Runs and taking away 07 wickets in the tournament. Hemant Sahu was gifted with a priceless reward of employment in Godawari Power & Ispat Limited. Silyari Team won the toss and choose to Bat first and scored 51 as target for opponent team. In reply, Siltara team batsmen easily achieved the target to by 05 wickets. Whereas Somesh adjudged Man of The Match with 4 wickets. In closing ceremony Shri R. S. Chouhan, Regional Director ESIC & Former Ranji Player Shri Ajay Ramnani facilitates their gracious presence as Chief Guests. Shri. 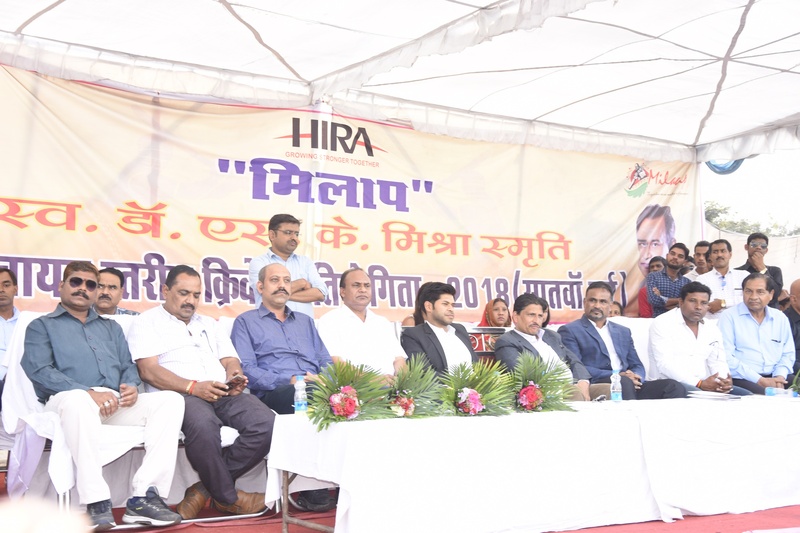 Dhanesh Yadav, Vice President – Janpad Dharsiwa, Shri Salik Ram Sharma, Janpad Member, Shri Vikas Chandravanshi Janpad Member are guests of the event. Addressing the concluding ceremony, chief guest Shri R. S. Chouhan said that he was very excited by seeing the final match held between the teams. He also mentioned the dedication of all the 48 teams participated in this tournament. Former Ranji Player Shri Ajay Ramnani addressed that he was amazed by seeing a Cricket Ground in Industrial Area. He congratulates the winner & runner teams for their outstanding performance in match. He says that many untapped talent found in this tournament & he hope from them excellent players can be found for future. The Executive Director Mr. Abhishek Agrawal of GPIL thanked the Sarpanchs, representatives and captains of the 48 teams for their corporation in MILAAP Tournament. A vote of thanks to all members of MILAAP committee, management of GPIL, all the Sarpanch of villages & viewers was expressed by Mr.Mansoor Ali for making event another success.